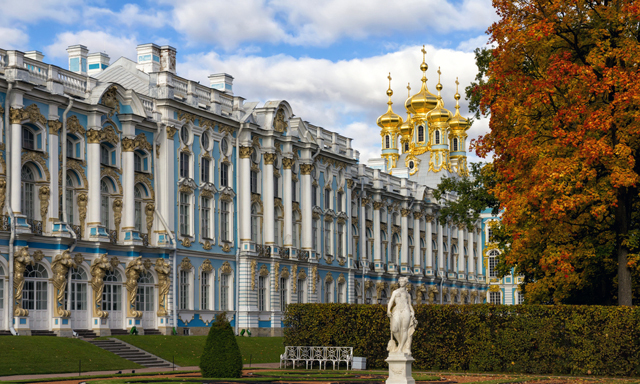 Explore Catherine Palace, the magnificent palace complex that was the summer home of the czars for two centuries. Marvel at the gorgeous Rococo palace's gold, aqua and white facade. Your guide will take you through great halls and private chambers inside, including the Throne Room, State Dining Room, the Portrait Gallery and the incredible Amber Room. Visit the palace's beautiful gardens and enjoy a short walk in the breathtaking Catherine Park. • Palace: Marvel at one of the world's most dazzling palaces; see the Portrait Gallery, Throne Room and legendary Amber Room. • Photo and video are not allowed in the Amber Room. • Large bags, umbrellas and heavy coats must be checked prior to entering the Catherine Palace. • The Catherine Palace may change exposition or close some halls without notice. • Guests must be able to walk approximately half a mile over gravel paths and even surfaces, with approximately 45 steps. • Special shoe covers must be worn when touring the palace. • Camera and video fees at Catherine Palace are included. • Flash photos are usually not permitted in areas displaying paintings. • Museums may change their exhibits or close some areas without notice. • There is a gift store in the Palace and local vendors near the bus park. • Heavy traffic is frequent along this route, causing delays and reducing time at destination. This is beyond the control of the local agent and/or Royal Caribbean International.